Over the past three years my colleagues and I prepared and delivered multiple trainings “Modern Web Development with AngularJS and Java“. We felt pretty comfortable with the framework, and the training was structured around building a sample Online Auction app with AngularJS on the front and Java EE on the back. During the last year we’ve developed and deployed in prod the Easy.Insure app using Google Dart and AngularDart. So AngularJS became our framework of choice. When Google announced a complete re-write of the AngularJS, we were not disappointed. Angular 2 will make this framework better. I’ll be writing this book with my colleague (and co-instructor) Anton Moiseev. This is going to be a tough project because Angular 2 is in Alpha now, and the API changes weekly, literally! I had this experience in 2006 while writing with my colleagues on a book on Adobe Flex 2, which went through one Alfa and three Beta versions while we were working on the book. We had to re-write code samples multiple times. It was a challenging but interesting project. Now we should do it again. It goes without saying that this book we’ll also write in a plain text editor using the Asciidoc markup and Asciidoctor for generating the HTML and PDF versions. We want to thank Manning Publications for accepting our book proposal. Below is a short version of Table of Contents. So far only the Appendix on EcmaScript 6 is written, but by the end of July we should have the first three chapters ready as well. I’m sure it’s going to be success and most importantly, as always, it will help readers to learn Angular by example and to improve their knowledge in enterprise web development. Can’t find nothing about Angulas creating custom directives in your ToC, Yakov. As for me, directives are one of the most powerful features of Angular among data binding and dependency injection which we use in our project on daily basis. Angular 2 is component-based. So directives will be created as components. Ah ok. We use 1.x.x in production so I haven’t see 2.x in details yet. I think it is a time. Thanks Yakov! Do you plan something for Dart development for Angular 2? Great to hear of this effort, Yakov! I learned a lot from your contributions over the years with Flex, and now that we’re planning a major Flex-to-Angular2/TypeScript migration, this is exciting to see. I really like your emphasis here on modularization and web components, and look forward to reading it. One subtopic that I don’t see explicitly covered here (but may be outside of your scope) is the best / most-natural way to integrate a core UI library into the framework, given that Angular2 is all-in on Web Components. Right now Polymer is the front-runner Google-approved WC library, but it’s not clear yet how to best integrate it, given that some of its elements’ functionality overlaps with Angular2. Hopefully we’ll hear clarification on this from those teams in the coming months. Thanks. It’s really a moving target at this point. We are looking very closely at Polymer and started a pilot project in our company. It looks very promising and we also hope to be able to migrate a bunch of Flex components to Polymer. Very nice! Some recent Google I/O presentations had something similar. Looking forward to this becoming more established in the coming months (looks like it would still have a lot of browser-specific variances, especially regarding where/how source data to the UI is stored/structured offline). Yakov, one other item I’d love to get your take on: in your experience so far, do you find the Ang2 component syntax to be as flexible/powerful/readable as something like well-organized mxml/AS was in Flex? The reason I ask is that I’m having trouble embracing the Ang2 code examples I’ve seen so far, from the standpoint of flow/readability. I mean, I’m 100% sold on the Ang2 *concepts*; but so far, the syntax implementation in component code just feels really awkward to me. I’m really hoping that it’s just my complete lack of experience with it; that I’ve yet to shift to “thinking in Angular.” And since you came to it with a similar Flex background, I’m wondering if you has a similar experience before it all “clicked” for you. Flex is/was a joy to work with; I’m hoping Angular feels the same. On the negative part, the JS ecosystem has too many things in general that must be put in place to set up your project. There is a risk that the enterprise crowd will resist to adoption of Angular 2 since many application are already written in Angular 1. Google’s position in the enterprise world is weaker that Adobe’s in 2007. Thanks, Yakov – that’s a helpful perspective, and makes sense with what I’ve seen so far. It’s a hard choice moving away from such a mature framework, but the difference in level of developer activity and evolution of the platform makes the transition from Flash to web an inevitability (for us); thankfully things appear to be in much better shape today than even a few years ago. I look forward to the book! 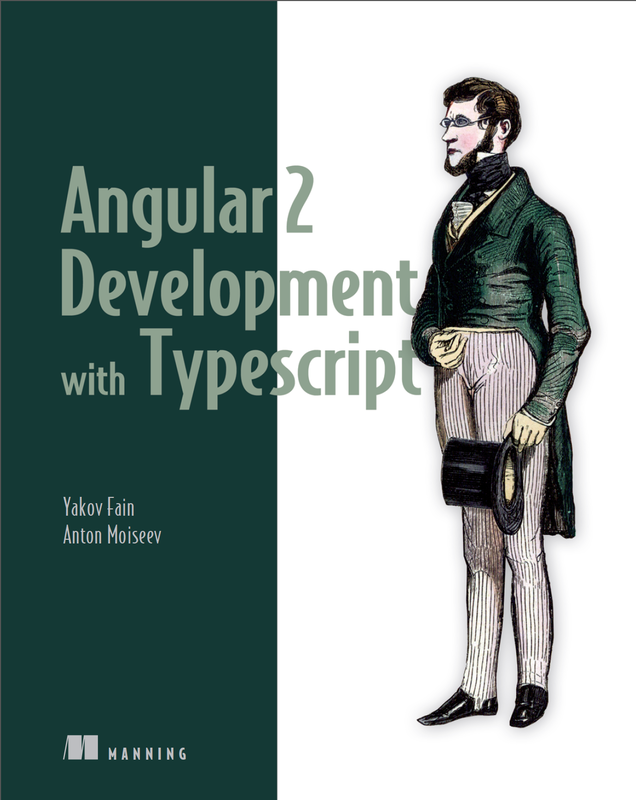 The code from the book is Typescript 1.5 based or ES 6 ? Thanks.